It is all smiles for the founder and General Overseer of The Synagogue, Church Of All Nations, Prophet T.B Joshua has been honoured in faraway Isreal. 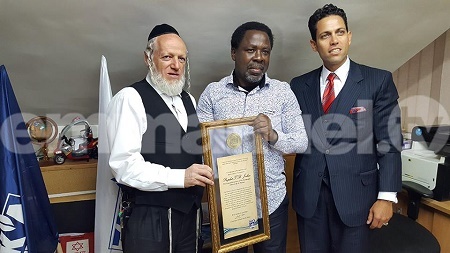 Prophet T.B Joshua, who is the General Overseer of The Synagogue, Church Of All Nations (SCOAN), has been honoured with an award over his humanitarian services to people in need. This is coming after he had a meeting with a number of Israeli government officials and top dignitaries. After that, he later visited Greece where he visited some Biblical sites. "After the recent earthquake in Ecuador Prophet.T.B. Joshua and Emmanuel TV Partners reached out by chartering a cargo plane which carried 20 tonnes of emergency relief to distressed areas affected by the devastating earthquake. Apart from bringing immediate relief aid, rebuilding of a school and other constructions are taking place. An Israeli rescue and relief organization recognized by the United Nations, ZAKA had taken cognizance of this and numerous other charitable deeds done by Prophet T.B. Joshua and the Emmanuel TV Team. "ZAKA’s chairman, Rabbi Yehuda Meshi Zahav came to The SCOAN last week and escorted Prophet T.B. Joshua to Israel to award him for his efforts and to also invite him to partner with them to advance the work of God in the nation Israel. "During his visit, Prophet T.B. Joshua held meetings with a number of government officials, including the Mayor of Bethlehem - Mrs Vera Baboun, Mr Ayoob Kara - the Deputy Minister of Regional Cooperation in the Government of Israel and his team, Ambassador Ran Ichay - Senior Deputy Director to Prime Minister Netanyahu and Mr Rafi Eitan – Former Mossad Intelligence Officer, who hosted the Prophet in his home. "After his visit to Israel, Prophet T.B. Joshua stopped in Greece where he visited Biblical sites including the City of Philippi where Paul and Silas were jailed and released after singing praise to God while in chains. He took some moments to pray for viewers whilst at this holy place. Indeed, for those whose lives are centered on Christ the best is always yet to come."